Combine the first seven ingredients; beat on low speed for 30 seconds. Beat on medium speed for 2 minutes. Pour in pans. In a large bowl, cream the butter, confectioner's sugar and cocoa until light and fluffy. Beat in milk until smooth. Spread frosting over top and sides of the cake. I doubled the cake recipe for my 10 in cake pan and used the single recipe for the 8 in cake pan. I used a single recipe to make the two 4 in round cakes with the cake mix left over. For the strawberry decorations, I used 6 quart containers of strawberries and 4 bags of navy blue candy melts, 1 bag of white candy melts and 1 bag of red candy melts. Melt the blue candy melts and dip the strawberries. Melt the red candy melts and use a plastic bottle to draw on the uniform outline. Melt the white candy melts for the buttons and belts. Make these the night before. After making the cakes and letting them cool, I frosted them and stacked the 8 inch and 10 inch. I made the ganache and used a plastic squirt bottle to go around the edge of the cake and let it drape down. I cut out a piece of cake out of each of the 4 inch round cakes so I could put the handles of the plastic toy swords in it to cross over the other cakes. 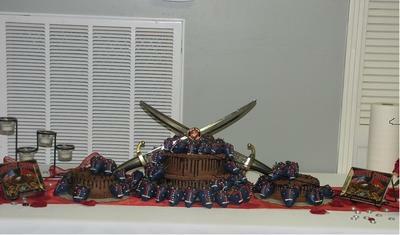 I then took some of the icing and piped around the swords to keep them in place. I stacked the decorated strawberries down the cake and around the swords. This was a cake I did for my son's best friend who is in the Marines. Everybody loved the strawberry soldiers. I was very pleased at how it turned out.